Route 131 leads up the ocean town of Pacifidlog. Again, there are trainers here. 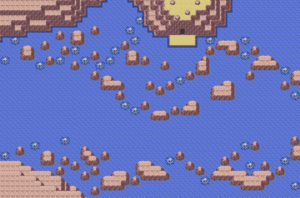 It also leads up to Sky Pillar, which is unlocked after beating the Elite Four in Ruby and Sapphire. In Emerald, it is available a bit earlier in the game, after Groudon and Kyogre are awakened and begin fighting in Sootopolis City. This page was last edited on 27 November 2018, at 04:45.